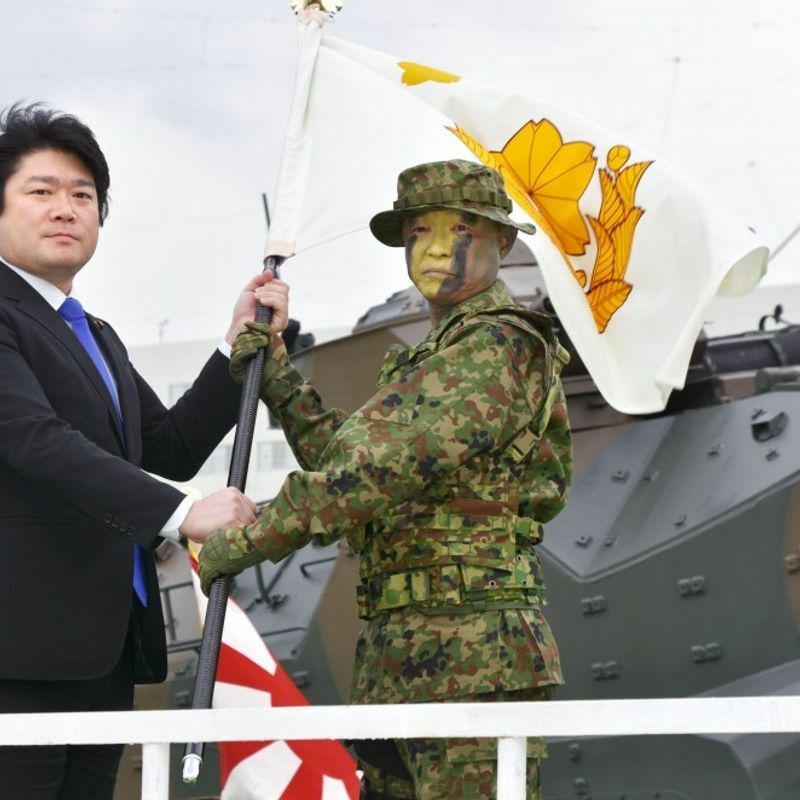 SASEBO, Japan - The Japanese Ground Self-Defense Force has marked a historic milestone through the launch of its first dedicated amphibious fighting unit, long deemed to be too offensive to possess under the country's postwar defensive security policy. "Our goal is to become the world's top-class amphibious operation unit," Maj. Gen. Shinichi Aoki, who leads the brigade, boasted at a press conference on Saturday following a ceremony to mark the launch of the new unit based in the southwestern port city of Sasebo in Nagasaki Prefecture. 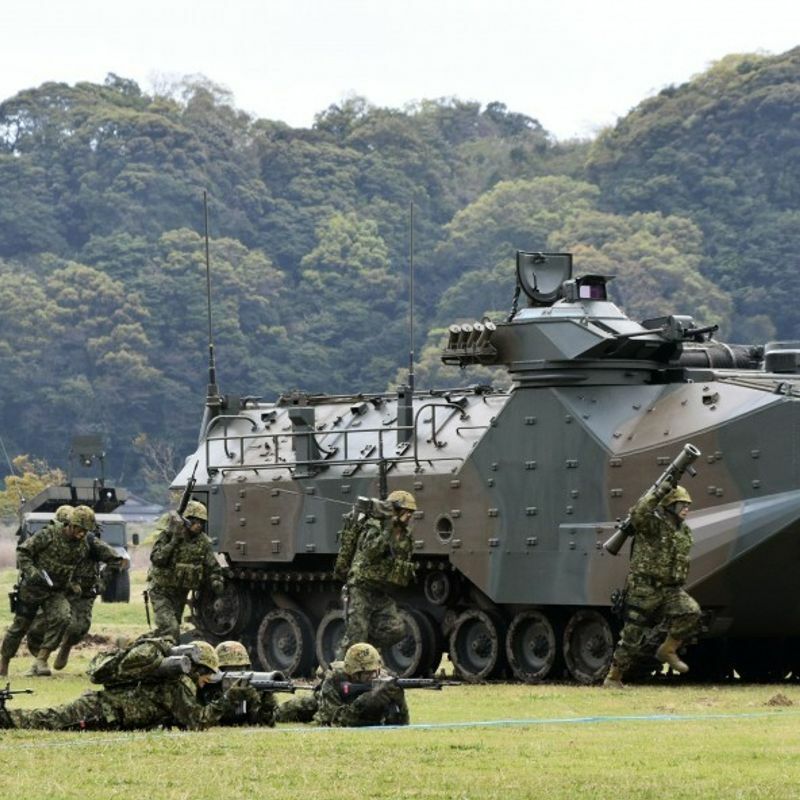 But the Amphibious Rapid Deployment Brigade, modeled after the U.S. Marine Corps, still seems to be a fledgling force facing challenges to enhance its readiness to defend Japan's remote islands in the southwest in the face of an increasingly assertive China. Until around 10 years ago, the development of amphibious tactics for landing troops on enemy-held shores was seen as a "taboo" in Japan under the pacifist Constitution, which has limited the capabilities of the Self-Defense Forces to the "minimum necessary level." But China's accelerating maritime expansion and tensions linked to its claim over the Japanese-controlled Senkaku islets in the East China Sea have pushed Tokyo to beef up its defense for its southwestern islands -- extending over 1,000 kilometers from the southern Japanese main island of Kyushu toward Taiwan. "I believe the presence of the amphibious forces will work quite well against countries with any intention to make advances toward our territory," Koichi Isobe, a retired lieutenant general of the GSDF, said, adding that the "deterrence effect" is likely to be bolstered through the collaboration between the Japanese and U.S. Marines. During Saturday's ceremony held at GSDF Camp Ainoura in Sasebo, Japanese troops in camouflage face paint impressed the audience in a demonstration exercise carried out on a grass field, showing off skills to slide down a rope from a helicopter and carry out attacks, rushing out from newly acquired Amphibious Assault Vehicles-7 to successfully "retake" the island. But actual operations may not go as smoothly as seen in the 20-minute demonstration, with their success largely hinging on whether enough troops and the necessary equipment can be swiftly transported to an island that has fallen into enemy hands. While Osprey tilt-rotor aircraft are expected to play a key role in ferrying Japanese troops to the island, the government has yet to win local consent for the planned deployment of the V-22 fleet at Saga airport in Kyushu as safety concerns were heightened after a GSDF helicopter crashed into a house in Saga Prefecture in February. The government is considering tentatively placing the Ospreys at a GSDF camp in Chiba Prefecture, near Tokyo, a government source has said, but the plan would apparently be a compromise as it would create a 1,000-km journey to Camp Ainoura where the amphibious force is based. To storm a beach, the brigade also needs its amphibious assault vehicles to be brought to waters closer to the island by the Maritime Self-Defense Force's transport ships. But the combined capacity of the three existing ships falls short of loading the entire fleet of 52 vehicles which is to be supplied, according to a person familiar with the matter. If loaded fully with the armored assault vehicles, the MSDF vessels would then be left with no room to carry the large hovercrafts that are intended to transport troops, tanks and other armored vehicles. "I hope we have an amphibious assault ship (like the United States to boost our transport capacity)," a GSDF member said, but he added that the MSDF may not be on the same boat as it sees more significance in devoting resources to destroyers and submarines tasked to prevent the island from being invaded in the first place. Isobe, also a senior fellow at Tokyo-based think tank Asia Pacific Initiative, said the "reinforcement of seaborne transport capacity is essential" for actual amphibious operations, along with an increase in the number of transport aircraft that can quickly mobilize GSDF troops from other parts of the country. He also highlighted the need to secure an exercise area in the southwestern islands for the new brigade to hone their skills, with members not having many chances to conduct large-scale amphibious training in a beach area unless traveling to the United States. Meanwhile, Robert Eldridge, an American expert on Japan's SDF and other security issues, was skeptical that the rather "feeble" amphibious force is the solution to the Senkaku dispute, arguing that the Japanese government should do more to demonstrate its clear control over the uninhabited islets by setting up civilian infrastructures such as ports and lighthouses. "I think the government is placing too much burden on the SDF (to defend the islets)," he said. But Eldridge said Japan's moves to possess amphibious capabilities are still "important" as they can also be useful for disaster relief, such as in situations when ordinary transport vessels cannot operate, and to deal with possible attacks by armed groups or terrorists. The former official of the Marine Corps Installations Pacific in Okinawa said that in order to become "Marine-like" the SDF members may also need more experience "in the field," given that the SDF have never engaged in actual combat since their inception in 1954 under the war-renouncing Constitution. years (including U.N. peacekeeping operations), through which they must have gained valuable experiences. While the current Japanese government appears largely reluctant in sending troops overseas, I think they should continue to grow in those experiences," Eldridge said. As the GSDF seeks to explore its new role in national defense, falling public confidence in the organization is likely to be the last thing it wants. With the GSDF facing fresh accusations over an alleged coverup of activity logs for an overseas mission, less than a year after a defense minister resigned over a coverup scandal related to different GSDF activity logs, Eldridge indicated that "transparency and accountability" are the key for the Japanese troops to continue to operate based on public support.